I was sitting in the Trader Joe’s parking lot getting my things together to leave the car. I looked up and saw a young man walking slowly. He had a grocery bag in his left arm; in his right hand was his daughter’s hand. She was toddling alongside him, her black hair, in pigtails, bouncing up and down with each step she took. She held on to her father with her left hand and in her right hand she held her drinking cup. It was a delightful scene — the pair walking quietly together. The father was looking straight ahead, deliberately taking slow steps, leading them to their destination; she was looking about her. Fathers walk with their daughters (and sons) in many different ways. 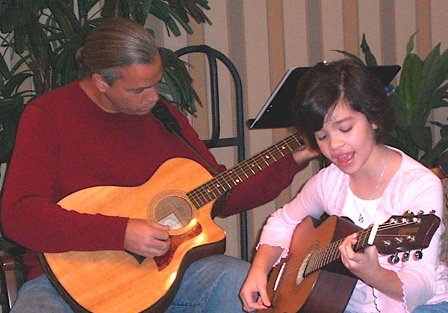 In this photograph, Don is walking with Noah as she sings for a group of elderly people. She was reluctant to play guitar and sing for them until he encouraged her by telling her he would accompany her on his guitar. 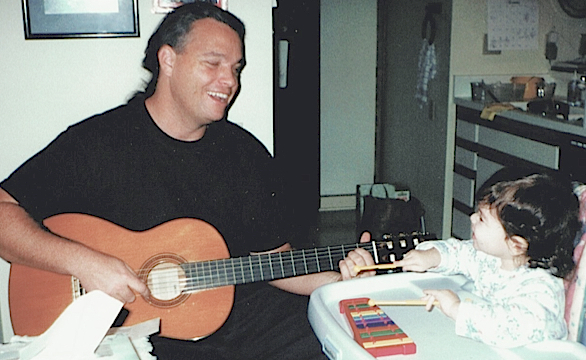 This duet began when Noah as a toddler. They sing and play their instruments well together; Don always encouraging her. Don has held Noah’s hand many times while they walk together. One day, if the Lord wills, he will hold her hand while he walks her up the aisle to her future husband. Just thinking about this future scene makes my heart swell within me and brings tears to my eyes. In watching the young man walk with his little girl, steadily heading toward their destination, I saw my heavenly Father walk with me. He walks with me on the path specifically designed for me, while holding me by His righteous right hand. There is strength in the way He holds my hand; it is not an overbearing hold, but one that says, “I am with you and will protect and care for you as you walk with Me.” And though He may lead me to where I may not want to go, how can I not trust Him? He has promised to lead me with His eye; His eyesight is much better than mine, for He sees with foresight. His very presence comforts me. Bless Him who walks with you every day. Thank Him for leading you each day and walking alongside you, holding your hand; there is no need to fear, for He is with you. Ask Him to lead you as you lead and teach your children; He is faithful to give wisdom to those who ask. Heavenly Father, we are a blessed people — who are called by Your name. Thank You for walking with us every day and upholding us with Your strong and righteous right hand through every circumstance; in Jesus’ name, amen. This entry was posted in Christianity, Encouragement, Faith, Family, Jesus, Life. Bookmark the permalink.